﻿For the millions of mindfulness meditation mobile app users, there is good news: New research shows that they can reduce the body’s response to biological stress. A Carnegie Mellon University–led study found that one component of mindfulness interventions is particularly important for impacting stress biology. Acceptance, or learning how to be open and accepting of the way things are in each moment, is critical for the training’s stress reduction effects. Published in Psychoneuroendocrinology, the researchers offer the first scientific evidence that a brief mindfulness meditation mobile app that incorporates acceptance training reduces cortisol and systolic blood pressure in response to stress. "We have known that mindfulness training programs can buffer stress, but we haven’t figured out how they work," said David Creswell, associate professor of psychology in CMU’s Dietrich College of Humanities and Social Sciences. "This study, led by Emily Lindsay in my lab, provides initial evidence that the acceptance training component is critical for driving the stress reduction benefits of mindfulness training programs." For the study, 144 stressed adults participated in one of three randomly assigned smartphone-based interventions: training in monitoring the present moment with acceptance, training in monitoring the present moment only or active control training. 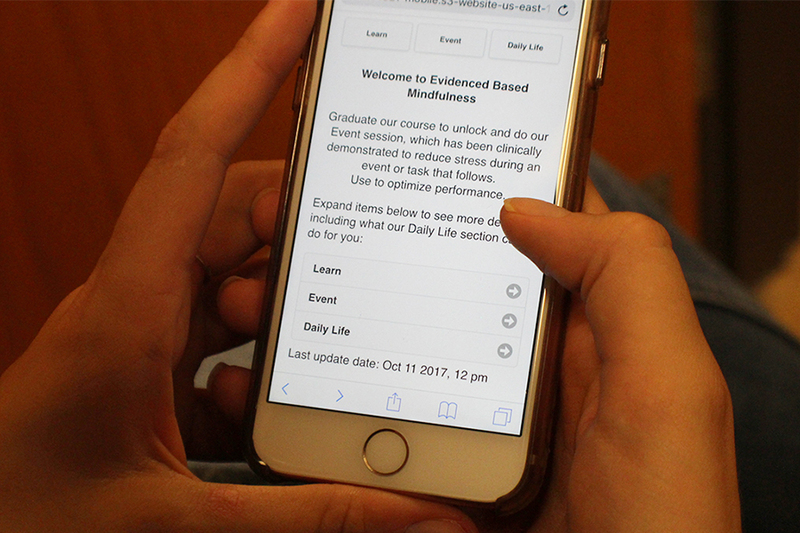 "Not only were we able to show that acceptance is a critical part of mindfulness training, but we’ve demonstrated for the first time that a short, systematic smartphone mindfulness program helps to reduce the impact of stress on the body," said Lindsay (DC’17), who received her Ph.D. in psychology and is now a postdoctoral research fellow at the University of Pittsburgh. "We all experience stress in our lives, but this study shows that it’s possible to learn skills that improve the way our bodies respond to stress with as little as two weeks of dedicated practice. Rather than fighting to get rid of unpleasant feelings, welcoming and accepting these feelings during stressful moments is key." An app developed by Shinzen Young and 01 Expert Systems was used for the study. In addition to Lindsay, Creswell and Young, Penn State’s Joshua M. Smith and Kirk Warren Brown, of Virginia Commonwealth University, were involved in the research. Yoga Science Foundation, the Mind & Life Institute and the American Psychological Association funded this research. Watch a video of Creswell describing the study's findings.